Brass Bookmarks with laser cut design. Available in different sizes and different designs. Book marks , give your loved ones a special gift, so that whenever they open a book they will remember you. Loaded with pearls, charms and satin ribbbons. Bookmark in the shape of a peacock feather. Hand drawn. Paper used is best quality handmade paper. Handpainted in different figures like - Ragini, animal figures, god, birds etc.The book mark given an elegant look to your study table and library.These book marks can be gifted to all and can be ordered in bulk to suit yoiur requirements. 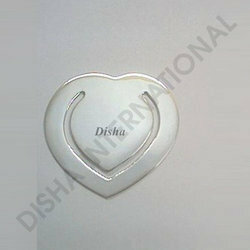 A comprehensive variety of Bookmarks can be availed from us at industry leading prices. These have many applications in a range of different sectors, as these are a great marketing tool. Moreover, these are an affordable and functional way to promote a product.These are made from 925 sterling silver. We are looking for only foreign buyers.